This crunchy and smokey slaw has been on repeat at the farm this past week for quick lunches with the crew. We just joined a tuna CSA (Day Boat Tuna) which just so happens to be the same guys I went fishing with a few weeks back and caught my first ever tuna! You can read about that wild experience here. What I love about these guy’s operation is that Day Boat Tuna is caught one fish at a time and brought back to port for processing by local fisherman within a 24 hour period. I learned that this process preserves the albacores natural nutritional value and just simply tastes better. Local folks–think about joining their CSA. It’s awesome! 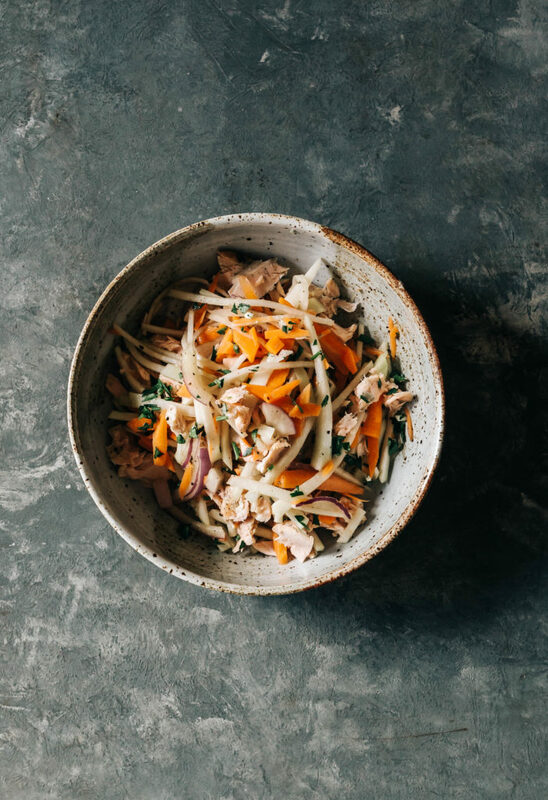 Anyhow, this slaw is perfect for a light meal on its own or even better when added to a piece of sourdough toast for a little crostini action. It’s absolutely delicious and a breeze to whip up. If you can’t find smoked albacore tuna you can use regular tuna. I’m going to continue to post the milage of the ingredients on our plates for the rest of the month. I hope it’s been interesting to see. We’re blown away by how well we can eat within a 200 mile radius of our home. Who knew?! In a large bowl combine the julienned veggies and season with a bit of salt and pepper. In a smaller bowl combine the yogurt, vinegar, tuna, salt, oil and pepper. Mix well. Add the mixture to the bowl with the veggies and toss in the parsley. Taste for seasonings and adjust as needed. I’m always happy to see a new idea for slaw. Some version of a slaw is often a part of our lunch.